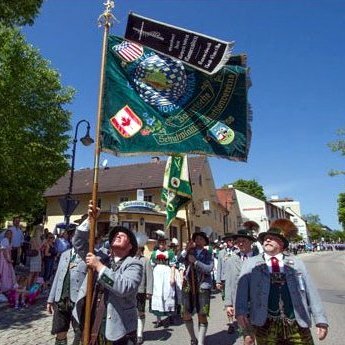 may be joined by Vereine (societies) who further Bavarian and Tyrolean folk dancing, Tracht, customs, and culture. Each member Verein must possess traditional Gebirgstracht (ethnic costume of the region). Application may be made by contacting the Gauverband’s Schriftführer (secretary) for more detailed information on the requirements and process of membership, fees, and the membership application. Petitions for membership are acted upon at the biennial Delegates Meeting, held in early May of every “even” year. To contact the Gauschriftführer, drop us an email. Want to see a map of where our member Vereine were as of 2015? Click here. The map can be downloaded and printed at up to 11" x 17", suitable for framing. The beautiful map was printed for the occasion of the grand opening of the Trachtenkulturzentrum in Holzhausen, Bavaria. The opening was in 2015, hence only Vereine that were in existence as of that date are included on the map. Read more about the map at this link.